Levi Johnston continues his campaign of admirable restraint; this month, he's talking to Vanity Fair about Bristol's pregnancy and the Palins' parenting skills. Highlights — and a video exploration of Johnston's "johnson" (sorry, it's SFW) — after the jump. Vanity Fair's clearly milking this interview for all it's worth, as evinced by the beefcake "behind the scenes" video below. Watch "advisor Tank Jones" help Levi put on his suit! Watch him suggest that Levi pose for Playgirl (according to Tank, models for said publication cannot be "lacking in the johnson area")! Basically, Tank's discussion of different Playgirl models' johnson endowments steals the show here. The actual article promises more, um, substance. In the few tasty tidbits doled out by VF's website (full text hits New York and LA newsstands today), we learn that Sarah and Todd Palin didn't cook, and let their kids fend for themselves. 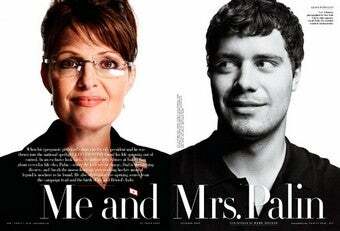 The Palin brood even had to do their own laundry (shame!). Levi also says Palin was "pouting" after her failed vice presidential bid, and that she wanted to exchange her governor's seat for a book or TV career which would be "triple the money." According to Levi, Palin actually said, "I want to just take this money and quit being governor." "But," says Johnston, "she didn't know how to do it." Guess she figured that out. Sarah told me she had a great idea: we would keep it a secret-nobody would know that Bristol was pregnant. She told me that once Bristol had the baby she and Todd would adopt him. That way, she said, Bristol and I didn't have to worry about anything. Sarah kept mentioning this plan. She was nagging-she wouldn't give up. She would say, "So, are you gonna let me adopt him?" We both kept telling her we were definitely not going to let her adopt the baby. I think Sarah wanted to make Bristol look good, and she didn't want people to know that her 17-year-old daughter was going to have a kid. So remember all that stuff about Trig really being Bristol's baby, whom Sarah just passed off as her own? Apparently it wasn't that far off. That is, if you believe Levi. And with a face like that, how can you not?